The market is flooded with an array of investment options that allows the investors to earn money, when the stock market is rising or falling or going sideways. Options are one of the significant categories of derivative securities, which connotes a contract between parties, in which one party acquires right to trade the underlying security, at an agreed price, on or before a particular date. The right to buy is call option while when the right relates to selling, it is a put option. Calls allow you to make money when the value of financial products is going up. On the other end, puts will reap money when the stock price of the underlying asset are going down. Just take a glance at this article to know more distinguishing points between the two. Meaning Call option grants right to the buyer, not the obligation, to buy the underlying asset by a particular date for the strike price. Put option grants the right to the buyer, not the obligation, to sell the underlying asset by a particular date at the strike price. A derivative contract between buyer and seller in which the buyer is offered the right to buy the underlying asset, by a certain date at the strike price. When you purchase a call option, you purchase the right to purchase the financial product on or before a specific date in the future, at a fixed price. For this, you need to pay an upfront cost in the form of premium. When the buyer exercises his option to buy the stock from call option, the seller is obligated to sell the stock, at the price agreed by the parties earlier. All the stock market instruments are covered in the call option such as stock, bond, currency, commodities and much more. A put option is defined as an option contract between two parties, buyer and seller, whereby buyer has the right to sell the underlying asset, by a certain date at the strike price. The buyer of the option must pay the premium to earn such right. When you purchase a put option, you earn the right to sell the stocks, on or before a certain future date, at a set price. Once the buyer exercises his right option to sell the underlying asset, the seller has no choice other than buying the asset at the agreed price. So, the seller is obligated to purchase the financial instrument. In other words, the reverse of a call option is a put option. The right in the hands of buyers to buy the underlying security by a particular date for the strike price, but he is not obligated to do so, is known as Call option. The right in the hands of the buyer to sell the underlying security by a particular date for the strike price, but he is not obligated to do so, is known as Put option. A call option allows buying option, whereas Put option allows selling option. The call generates money when the value of the underlying asset goes up while Put makes money when the value of securities is falling. The potential gain in case of a call option is unlimited, but such gain is limited in the put option. In the call option, the investor looks for the rise in prices of the security. Conversely, in the put option the investor expects stock prices to go down. Some similar aspects are there in the two investments like both acts as an agreement between the buyer and seller in the financial market, where time works as an essence of the contract, i.e. the option needs to be exercised before the time expires. Moreover, the losses in both the cases are limited to the amount paid on premium. Suppose A (buyer) purchases a call option and enters into a contract with B (seller) that A will purchase 1000 shares at Rs. 200 per share of Alpha Ltd. after three months, and pays a premium of Rs. 5000 for the same. If after three months the prices of the shares are Rs. 220 then A can purchase shares from B at Rs. 200 by exercising the right and B is obligated to pay the same while if the prices go down to 180 then A will not purchase the same from B because he can purchase the same from any other person at Rs. 180 from any other person in the market. Suppose A (buyer) purchases a put option and enters into a contract with B (seller) of selling 1000 shares of Rs. 200 per share of Alpha Ltd. (present prevailing price in the market) after three months from the date. A pays a premium for it, of Rs. 5000. Before the expiry of the term, the price of the company falls to Rs. 180 per share, then A can purchase the shares from the stock market at Rs. 180 per share and sell them to B at Rs. 200 per share. However, if the share price increases to Rs. 220, then there is no use of purchasing it on high rate at selling it at a low rate because that will ultimately amount to a loss for A. When you invest in a call option, you always expect the price to rise to reap more and more profits, whereas if you opt for a put option you want the prices to fall because only then you will be able to earn profits or else you will suffer loss up to the extent of the premium paid. 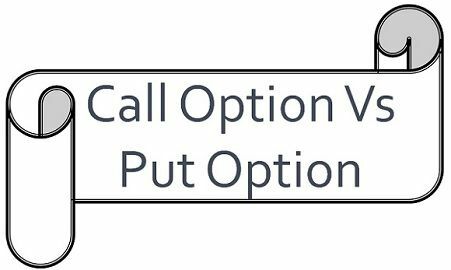 Call option and put option are the two exact opposite terms. This article cleared all my confusion on Call and Put option, thanks a lot. Thank you so much for this informative article.It covered every thing about basic option trading.